Legacy Recycling is the Racine Computer Recycling provider of choice. Whether you are looking to recycle 1500 network servers, 1000 laptops, or just a simple old ancient PC computer, we are an affordable one-stop provider ready to serve you. How does the process work? What happens after we take your old computers? Our highly skilled recycling technicians disassemble each electronic unit, making sure to sort each components part, and then determines the proper processing facility for each part. If you have private data that you would like us to destroy, it will be handled only by authorized personnel and kept in a secure location. All parts are then shipped to an R2/ISO certified recycling center. Legacy Recycling makes things easy and takes the work out of scrapping old computers, electronics, and other miscellaneous metal. We are fast, dependable, friendly, and affordable. Depending on what you have to recycle, we may even pay you for your scrap. Our mission is to make your experience with our company a pleasure. Call Legacy Recycling today for all your Racine E-Waste Recycling needs. 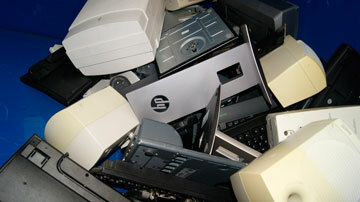 We are the electronic recycling Milwaukee and Racine specialists.